Yup! Another oatmeal recipe. I'm just really into oatmeal lately. First there was the tropically-flavoured banana coconut oatmeal, then the classically comforting apple pie oatmeal, and now this dainty and delicious peaches and cream oatmeal. I used dried peaches for maximum peachy flavour. I love a warm breakfast any time of year, but variety is important, no? Yes indeed! So I love having more than one oatmeal recipe on hand. This recipe makes enough for one adult or two small children. It can easily be doubled, tripled, etc. I brought the water to a boil in a medium saucepan over high heat. 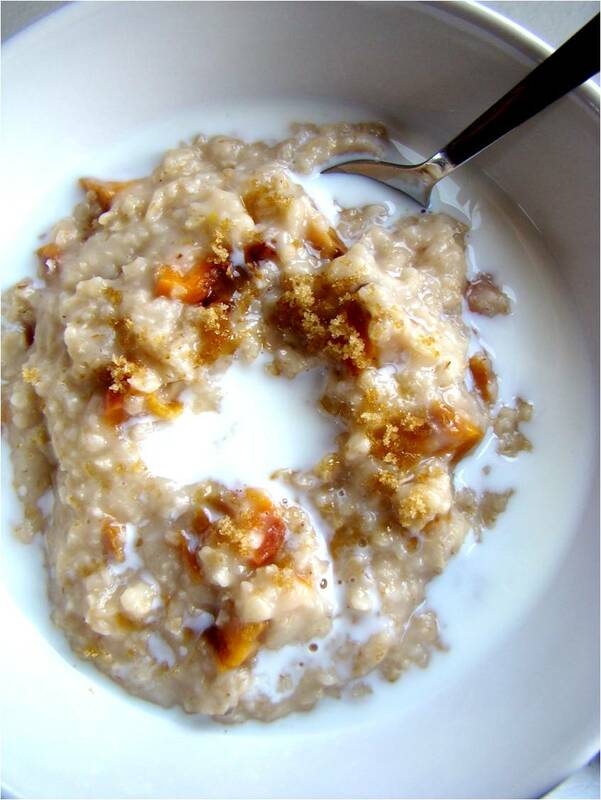 Then I added the oats, chopped peach, and sugar and lowered the heat to medium. Stirring frequently with a spoon, I allowed the oatmeal to continue cooking for a couple minutes, then removed it from the heat and stirred in the cream. I transfered the oatmeal to a bowl and served it with a splash of milk and a sprinkling of brown sugar. Peaches and cream is a pretty special flavour combination. Yum! 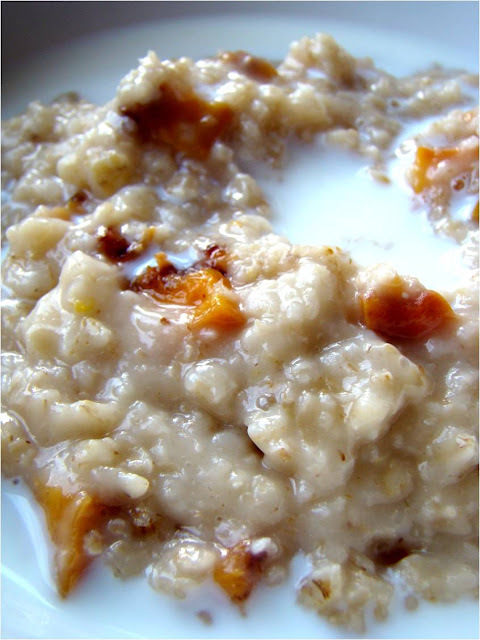 Does your family eat oatmeal? I still can't get my 3-year-old to even try it (argh)! Which dried fruits do you like to keep in your pantry? Elsie loves oatmeal, fortunately. This looks so amazing, your photos are mouth watering!!! It's funny... my picky family members that hate everything love oatmeal, especially with fruit. I sometimes just give them maple syrup or brown sugar to put in the oatmeal, but they always prefer fruit. Personally, I have a hard time with hot cereal, so I always end up eating something else. I don't mind, though, because it is a lovely, hearty breakfast that takes only a few minutes to make. I never thought to use dried peaches, I will have to try that. Wonder how it would work with other dried fruits, like apricots or craisins? We use craisins in our oatmeal prepared basically the same way (but no cream). It's delicious! I love adding fresh fruit to cooked oatmeal, including berries of all kinds, bananas, and fresh peaches. This is my first time trying dried peaches. I expected a "peachier" flavor, but the dried peaches didn't have that same sweetness and burst of flavor as fresh. Jen, I add Craisins all the time. Tasty! I also keep a jar of chopped walnuts in my freezer, and I like to add a sprinkling of them to my oatmeal as well. Dried figs are my favorite!! With some cinnamon and nutmeg, and almond milk on top.... Runner up is prunes and then raisins. 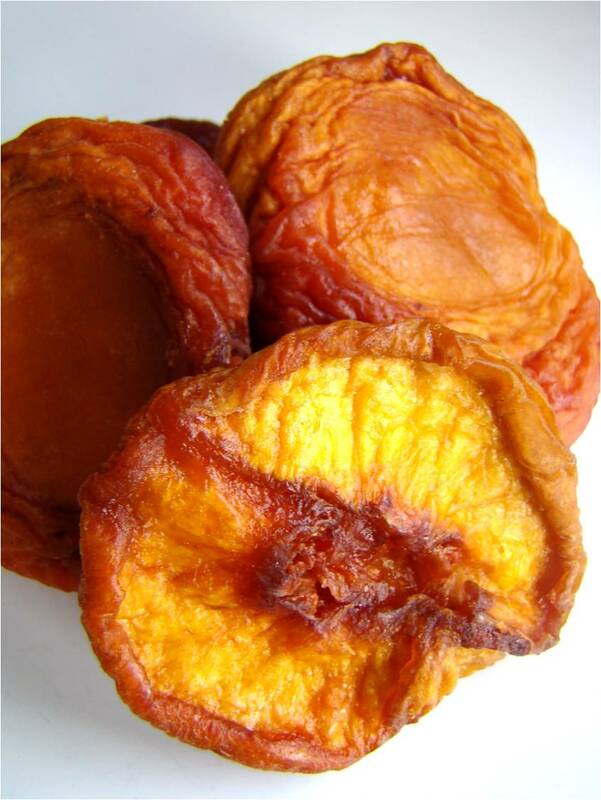 The dried fruit is so incredibly sweet that you never seem to need additional sweetener! I am learning to break out of my rigid thoughts about nutrition for my mental health, and previously I was very strict about dried fruit in that I had to make sure it was always the unsulfured variety, which is easy to find for the typical prunes, raisins, and apricots, but for the more 'special' types like tropical fruits and berries, it is more difficult, but now I am going to allow myself to eat these things and not worry about it not being perfect. I am excited for the new flavors this will allow me to experiment with!! One of my favorite oatmeal flavors is mashed banana with cocoa powder! I also love taking about half of my oatmeal and blending it up in the blender with my fruit/flavorings to make a creamy mix, then I mix this with the remaining half, which allows me to still have nice texture. I almost always eat my oatmeal cold too. I find it tastes sooo much better, and becomes nice and thick and chewy vs. soft and gooey.